Another batch of Russia's Mil Mi-28NE Night Hunter helicopters has been supplied to Iraq, a source in the Russian defense sector told Interfax-AVN on Monday. "An Antonov An-124 plane airlifted four Night Hunter helicopters to Iraq on Sunday," he said. The first Mi-28NE delivery to Iraq was made in fall 2014. The Iraqi Defense Ministry said on October 30 that the helicopters had been prepared for being used against Islamic State of Iraq and the Levant (ISIL) militants. A military diplomat told Interfax-AVN earlier that Russia had been fulfilling the helicopter contract since it was signed in 2013 but it did not send any military specialists there in relation to that contract. 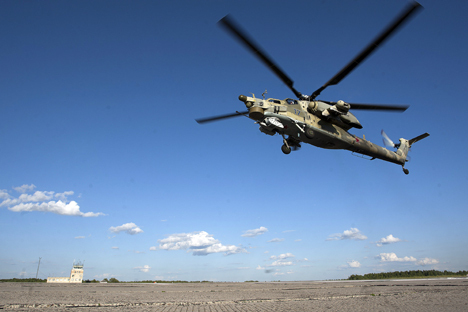 "Only the after-sale service teams of Russian Helicopters Holding plants are working in Iraq. There are no Russian military helicopter pilots there," the source said. Iraq and Russia signed a deal for over 40 Mil Mi-35 and Mi-28NE helicopters in 2013.